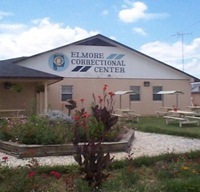 Elmore correctional center is a minimum security state prison that houses over 1100 inmates. The facility has a multitude of programs that the inmate can participate in, including substance abuse programs, and educational programs. Because this is a minimum security institution their are also many recreational activities the inmates can participate in. All inmate's at Elmore correctional center will have a job. Some of the inmates have jobs within the institution while others can work off the facility grounds under supervision. The only time this facility has the inmates locked down to their cell is at night when inmates should be sleeping. Some inmates who are on a out of facility work duty are actually allowed to stay overnight at the worksite. Inmates can have visits once every two weeks (twice a month). One of the visits can be on a Saturday and the other on a Sunday. Visiting hours are from 7am to 1pm. Two or three times a year this facility will host a family night, usually from 3-7pm, in which inmates and their families can all get together on a Saturday. Upon arrival for visitation you will need to park and then go to the office where you will receive a number for visitation. You can usually arrive at 6:45am, but no earlier then 6:30am. At 7am the first numbers will start to be called for visitation, upon being called you will go inside and trade in your keys and ID for a second number. Next you can expect to be searched and then will enter the visiting area.